The elliptical Hangar 7 in the eastern part of Salzburg Airport measures 100 metres long, 87 metres wide and 14.5 metres high. The 4,100 square metre hangar serves as a museum in which vintage cars and aircraft are exhibited for air shows. ZINKPOWER Brunn hot-dip galvanized components for the steel construction. The reason for building Hangar 7 was pragmatic: the Flying Bulls needed a new home for their collection of unique historical aircraft. As it had continually grown over the years, the old hangar had become too small – the Douglas DC-6B alone, with its wing span of 36 metres and nine metre high rudder assembly, would have needed to have been accommodated in another hangar. This simple necessity gave way to the vision for creating a meeting place for flying enthusiasts and art lovers instead of a functional building – an impressive place in every way. A worldwide unique combination of aircraft hangar, art gallery, restaurant and experience centre. Viewed from outside, Hangar 7 is reminiscent of the basic shape of a wing. Inside the building itself, the transparent shell opens to a heavenly expanse of sky - after all, the sky is where aircraft are most at home, especially the Flying Bulls' aircraft. Planning the world’s most extraordinary aircraft hangar began in October 1999 and construction started in January 2001. It’s not just the idea and concept of Hangar 7 that rises above the ordinary; the process of its construction was pretty extraordinary as well. The model even had to pass wind tunnel tests due to its unusual shape. 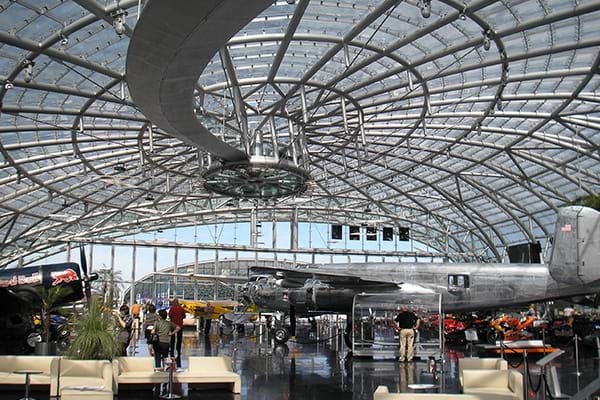 Hangar 7 at Salzburg Airport saw its official opening on 22 August 2003 – with a fittingly extraordinary celebration.